Yeah, Simon Peter was not the only person to be called Kephas. As a matter of fact, it was more of a title than a name. The real name of Kaiphas the high priest was Joseph. St. John wrote in Greek yet he kept the name "Kephas". The high priest was a wicked man. Yet, because of his office, he spoke prophecy by the power of the Holy Spirit. Sounds a bit like some of those Medici or Borgia popes, right? OOPS! You just blew it. I clicked on you Apolgetics and Agape site and saw the name William Webster. I won't even interact with his material. I sort of knew him when I lived in the Pacific Northwest and learned to distrust everything he puts out. That's all I am gonna say on that. If you, Ken, want to say something here, on James' site, I will happilyengage you. But I am not going to plod through Webster's stuff. William Webster's material is excellent. Maybe you avoid it because you cannot deal with his arguments. "learned to distrust everything he puts out"
a negative against you, not him. The guest to the 2 blogs starts making demands and rules to the host blogs! I was just trying to save time by not having to do all the typing and coding / linking again here, that's all. It is to be treated as if all here at this blog also. All the more reason for me to highlight Webster's excellent material even more. Volume 2 of "Holy Scripture: the Ground and Pillar of Our Faith"
When I have more time, I will be created more articles from his material. I added Webster material here just to goad you into actually interacting with any of his arguments and points. I also discovered the full text of Augustine's "The Unity of the Church" vs. the Donatists. For the first time in history, the full text has been translated into English. (Amazing that it took so long !! centuries, a millennia and one half !!!) I look forward to reading this, studying it, and writing more on this in the future. Ad hominem or not, that's where I stand and I can do no more. I seriously doubt if he has anything nice to say about me either. It's James' blog indeed, but I seriously doubt if you are going to get any opposition from him. Why don't you read Webster's stuff, digests it and then make YOUR case? I have read The Church of Rome at the Bar of History, the 3 volumes of King and Webster, and the Matthew 16 Controversy. We have digested them, that is why we make the arguments we make and have the blogs we have, along with other sources that are standard. It's pretty much the same basic case that Steve Hays, Peace by Jesus, James White, James Swan, Turretinfan, John Bugay, and I make against the Roman Catholic Church claims. I did not have time to read all of your 400 + comments now with Peace by Jesus and Steve Hays, it is too much to catch up on. Got to go to church now. back later; Lord willing. Don't try catching up on all the stuff on Peter. I can put it in a nutshell for you. I say there are passages where Peter is singled out from the other 11 Apostles. Steve says Peter was not singled out in such passages as, " Peter and the others" because "the others" are mentioned. He claims Peter was no more significant that Andrew, Bartholomew or Simon the Zealot. He also spends more time telling me how stupid I am and correcting my spelling than actually writing about Peter. PBJ concedes Peter was indeed singled out but not for what Catholics claim. He says Peter may have had some minor role of leadership among the not so significant Apostles. He also denies any succession of Peter or the other Apostles. I also insisted that Peter being named first in every list of the 12 to be significant. I would love to hear what you, Ken, have to say on Peter. We also discussed Sola Scriptura quite a bit. I said that before the invention of the printing press around 1450, SS was impossible as people didn't own Bibles. Steve pretty much just said I was stupid. He did however proffer a bizarre theory about people memorizing the Bible by heart. I asked him to flesh his theory out for me but, once again,he just dismissed me as stupid. PBJ however, submitted an equally bizarre theory about isolated pockets of Bible believers around Europe( maybe KJV only folks ) who managed to preserve the Bible from the romish Bible confiscaters. PBJ did not actually call me stupid like Steve did. Rather, he said I was an unregenerate Pope following sheep and therefore incapable of discerning the things of the Spirit. I tried to get Steve and PBJ to see how their different views of Peter reveals the need for an extra-biblical referee but Steve just, yeah, you got it, called me stupid. So now you are pretty much up to speed on the discussion between Steve, PBJ and stupid me. Peter definitely had more of a leadership personality, was bold, courageous, had faith; talked a lot; and got into trouble because of his pride and boasting. God the Father revealed the truth to his heart in Matthew 16:16-18 - the rock is the confession of faith that Peter spoke, the doctrine that Jesus is the Messiah, the Son of the Living God. Churches are built upon the rock of foundation of the doctrine of who Jesus is - the eternal Son of God, the Messiah who fulfilled all the OT about Messiah (suffering, atonement, resurection, kingly rule, etc.) The other disciples got the authority also, as shown in Matthew 18, and John 20:23; and all elders in a local church have authority to teach and do church discipline. Peter preached the Pentecost sermon in Acts 2; and also opened the door to the Gentiles in Acts 10-11 and 15, which agreed with the apostle Paul's doctrine that the Gentiles are justified by faith alone (Acts 15:9; Romans 3:28; 4:1-16; 5:1; Galatians 2:16; 1:6-9; chapter 3, Philippians 3:9; Ephesians 2:8-9). But Peter was also rebuked by Paul in Galatians 2.
and then later, elders in local churches, had and have equal authority to preach, teach and shepherd, but not any kind of "mono-episcopacy" and there is no such thing as a Pope or Papacy in the Scriptures nor in early church history. There is no apostolic succession of a person to have the same authority as an apostle, since the office of apostle ceased. Elders/overseers are to hold to the truth and sound doctrine, but it is not automatic and no one is infallible in their teaching. "The text [Matthew 16:18] says nothing about Peter’s successors, infallibility, or exclusive authority. " D. A. Carson, Matthew, Expositor's Bible commentary, volume 8, page 368.
all were sent with authority to preach and proclaim forgiveness if someone repented and believed and to declare them guilty if they do not repent and believe. "Peter definitely had more of a leadership personality, was bold, courageous, had faith; talked a lot; and got into trouble because of his pride and boasting." Do we ever see any of the other 11 calling him a blowhard and telling him to shut up fpr being so boisterous? Jesus approached the sleeping Apostles and rebuked Simon Peter. Why just him? Was he snoring louder than the others? "God the Father revealed the truth to his heart in Matthew 16:16-18 - the rock is the confession of faith that Peter spoke,...". The rock is Peter. From that point on the other 11 call him Peter although Jesus usually refers to him as Simon, i.e. "Jesus said to Peter, 'Simon are you sleeping'?" "The other disciples got the authority also, as shown in Matthew 18, and John 20:23; and all elders in a local church have authority to teach and do church discipline." But only Peter was given the keys and given a title. "Peter preached the Pentecost sermon in Acts 2; and also opened the door to the Gentiles in Acts 10-11 and 15, which agreed with the apostle Paul's doctrine"
Actually, it was to Peter and Peter alone that the vision of the great Net was shown. It was only to Peter that the abrogation of the Mosaic Law was was revealed, not to Paul. Peter opened the door to the Gentiles and Paul acted on that. "that the But Peter was also rebuked by Paul in Galatians 2." Popes have been rebuked by saints such as St. Catherine and St. Bridgette for hypocrisy but not doctrine. Galatians says Paul "saw" James but "consulted" with Peter. ( By the way, not all scholars agree that Cephas and Peter were the same man ). "But, Peter calls himself "fellow-elder" (1 Peter 5:1-5)." The Pope's title is "Servant of the Servants of God". "The other apostles had same authority (John 20:23 - all were send with authority to preach and proclaim forgiveness if some repented and believed and to declare guilty if they do not repent and believe.)" They all have the same power but not the same authority. Where do we see Andrew, Philip, the Sons of Zebedee or Simon the Zealot exercise authority for the entire Church? "and then later, elders in local churches, had and have equal authority to preach, teach and shepherd,"
Thank you Ken, for conceding Apostolic Authority. PBJ ain't gonna like this! "but not any kind of "mono-episcopacy" and there is no such thing as a Pope or Papacy in the Scriptures nor in early church history." That is what you are trying to prove. The Church Fathers say otherwise. "There is no apostolic succession of a person to have the same authority as an apostle, since the office of apostle ceased." The office of Bishop did not. Matthias was chosen to fill the bishopric left vacant by Judas. "... no one is infallible in their teaching." You don't believe that yourself, Ken. The Evangelists were infallible when writing scripture. "The text [Matthew 16:18] says nothing about Peter’s successors, infallibility, or exclusive authority. " The text says ALL about succession and power. Check out Is 22;22. The office bestowed there did indeed have those very attributes. If you concede Peter was chief among the Apostles, and that the Apostles were to rule the Infallible Church, they had to have that Power to some degree and Peter would need it in the highest degree. It's a logical deduction in you believe the Church to be infallible herself. If you deny she is infallible, you violate the principle of sufficient reason by saying a fallible Church produced infallible scripture. "all were sent with authority to preach and proclaim forgiveness if someone repented and believed and to declare them guilty if they do not repent and believe." By the way, you disagree with Steve and agree with me that Peter was indeed "special" in some way. Therefore you must be as "stupid" as me. Great to have you on board with me buddy! Thanks for the list of links, Ken. Looking forward to reading these. "Ad hominem or not, that's where I stand and I can do no more." Don't you think you've done enough Guy? Especially in light of the whipping you took from Steve? No; the Church is not infallible; never was. Only God and His Word are infallible. they had to have that Power to some degree and Peter would need it in the highest degree. No; your argument does not follow. Sorry, you did not make any logical argument here. I am curious as to the spanking meted out to me by Steve. Could you be a little more specific? My buns aren't smarting. What were some of the more salient points Steve made, in your estimation? Were you impressed by his denial that such passages as Mark 16:7 reveal Peter to be singled out for some/any purpose? How about in the corresponding passage in Luke where the others disciples aren't mentioned at all? What say you Arizona, was Peter singled out? For anything? How about for a rebuke in Mark 14:37? Would you say the fact that Peter is named first in every list of the Twelve Apostles means anything at all? I don't want to put words in anybody's mouth. Let me start off by saying that even without recourse to the haymaker passage in Matthew 16, without any word studies on "keys" or "Rock" or " feed my sheep" or whatever, Peters's infalliblity follows by logical necessity if you concede Peter was chief. Ken, you know I am leading you where you don't want to go. You think you can escape. You admit Peter to be leader, but of a *fallible* Church. You think you have me stymied at this point so lets talk about it. Do you really want to say that the Church is not infallible? If so, you have violated the principle of sufficient reason if you say the Bible is infallible. ( Ask Steve about it. I think he studied philosophy ). The Church predates the NT. The Church produced the NT. Can and effect be greater than its cause? Could the Church councils have erred in defining the Trinity? The Church is the Body of Christ. Is the Head holy but the Body corrupt? Is the Bride an unfaithful and adulterous spouse? Is the Church a harlot? Or a faithful and unspotted bride? Christ delegated all power and authority to the church before ascending. He promised her success unto the ends of the world knowing the 11 men he spoke to would all be dead shortly. Christ said that even the gates of hell would not stand against His Kingdom. "Only God and His Word are infallible". What good is an infallible book without an infallible means of reading it? Why give a perfect road map to a blind man? Think about those right wing survivalists living in the mountains, all with a copy of the U.S. Constitution in their shirt pocket. They don't pay taxes and refuse to apply for a drivers license or register their guns as they don't see the government being authorized to levy taxes and limit a person's right to drive or own guns according to the way they read the Constitution. They fail to realize the founders not only gave us a document to guide us but set up a living Supreme Court to interpret it too. The Constitution and the Supreme Court are not about getting us to heaven. They can err. They are not inspired nor infallible. The Bible and the Church are. Did you like Steve's theory of SS operating before the printing press made Bibles available to the common man? Steve brilliant theory runs something like this. 66 people get together and each agree to memorize a particular book of the Protestant Bible. That eliminates the need for a paper and ink book. So, who has 66 slaves that they can command to each memorize a book of the Bible? How does a guy flip through the pages of the memories of 66 people? Can people forget? Or die? Or lie? His theory is so nutty I cannot believe he tried to foist it on me. Arizoner, do you really think Steve turned me over his knee and gave me a whoopin'? "Can people forget? Or die? Or lie?" That sounds like an issue for the passing on of tradition as well. Peter was chosen as a leader, but as Steve pointed out (I think; I never read all of those almost 500 comments, just some here and there), he fades from the scene after Acts 15 and the apostle Paul is the main focus from chapters 13 onward to chapter 28, the end of Acts. I don't think Peter is even mentioned after Acts 15 in the book of Acts. No, I have not violated that principle, whatever you mean by it. sufficient reason to believe the church is also infallible? No, it does not follow at all. The Church predates the NT. The Church produced the NT. The Church did not "produce" the NT. God inspired the writings, through the means of the apostles and apostolic authority by someone given apostolic authority to write the document, i.e., Mark for Peter, Silvanus for Peter, Luke for Paul, etc. Possibly Jude wrote 2 Peter for Peter as Peter dictated it to him in prison. That would explain the similarities. God produced the NT; and the church discovered/witnessed to / approved it / confirmed what already existed. Can and effect be greater than its cause? God uses fallible humans, prophets, and apostles to accomplish His purposes in this world. Not a big deal. Your argument does not even move me a little. Argument from speculation and hypothetical and skeptical. Argumento de Hyperatio skepticalum hypotheticum. After studying the doctrine of the Trinity for years, the only credible option is what the Church formulated, protecting Monotheism, the Deity of Christ and the H.S. and the Scriptures testimony to their Deity and personhood / personal relationship with each other from all eternity past. They got it right, just as they got the canon right. Christ is working on His bride to make her holy and spotless and clean all throughout history and is still working on His bride. Christ delegated all power and authority to the church before ascending. wrong. He has all authority and power, and based on His authority, He sends out the disciples/apostles/ later, the church, to make disciples of all nations and teach and expand the church. He promised her success unto the ends of the world knowing the 11 men he spoke to would all be dead shortly. gates of Hades = death - true believers don't die spiritually (John 11:25; Revelation 20-22; and are protected from the second death, the lake of fire. see my previous article for more details and that totally blows Guy's argumentation away. The photo is now gone. Since you have so much time on your hands; why don't you go back and digest all the past relevant articles here - we have pretty much answered all your arguments before here; and if no specifically; James White and William Webster and John Bugay and Steve Hays and Turretinfan have before at their web-sites. You are just repeating what has already been thoroughly answered. Jason Engwer's articles also at Triablogue. "You are just repeating what has already been thoroughly answered." Yep. Nothing like beating a dead Roman horse. "Arizoner, do you really think Steve turned me over his knee and gave me a whoopin'?" Not only I but I think anyone who read that dialogue believes you had to type what you just did while standing up. Seriously, Guy. Why are you bent on turning Jame's personal blog into a debate forum? If you really want to debate why don't you join us in the Carm RC threads? You'll feel right at home there as your like-minded brethren share your penchant for posting things that only fellow graduates of the Catholic Answers Forums School of Theology could appreciate. Why am I turning James' "personal"blog into a debate forum? Like, why am I listening in on his private phone calls? Personal blog? On the internet? On the subject my religion? Do you Protestants want to talk to us or just about us? Does it matter if you even get the caricatures right? By the way, you haven't told me your spin on Peter. Or SS being possible before Bibles were even available to the average Christian? Do you agree with Steve? Do you even know what he wrote? The discussion went on for weeks. If you are going to hero-worship the guy, you should at least be able to articulate what for. "By the way, you haven't told me your spin on Peter. Or SS being possible before Bibles were even available to the average Christian?" Why would I visit Triabologue? You, Steve and John Bugeye gave me the bum's rush from that site? I don't care to lurk and read a conversation about by religion unless I am allowed to weigh in and keep the record straight. TurretinFan doesn't bother to answer his comments. So, again, I would have to suffer through inane blather about my faith in painful silence. I have forgotten more about James White and Bill Webster than you will ever know, Kenneth. But thanks for the suggestion. Why don't you come on over to Called to Communion or Creed Code Cult. I promise, you will not be received with the same snottiness shown to Catholics on Protestant sites. I forgot, what is your spin? For weeks now, you have posted one-liners like, " Now I know why I left Catholicism" and equally brilliant statements. Can you put two sentences together and make an actual argument? Or do you prefer to just stand on the sidelines and heckle? Me-He promised her success unto the ends of the world knowing the 11 men he spoke to would all be dead shortly. Thanks for conceding Infallibility to the Church. I agree with you on that - since it is on the internet; however, your arguments have already been answered and you go on too long. Do you Protestants want to talk to us or just about us? A good point; the main problem is time and also that you just repeat stuff that has already been answered. When and if I have time; I want to be a good example of how to talk to Roman Catholics. I suggested Guy visit other Reformed blogs and search and study the older articles that have already answered his points. I have in the past; and I enjoy interacting with David Anders - he is fair; but Bryan Cross is too philosophical and high to even understand and he moderates too strongly with "that is not on topic" (some others are that way also, but not as strong; Tim Troutman is pretty hard also.) and "that is not charitable", etc. He is too difficult to fit into his / their narrow window of what is allowed. Stellman's site - there are too many comments to keep up in the midst. He also has a weird style (IMO) and one has to catch the article at the beginning and follow all the comments in order to keep up and understand. It's too much; like trying to drink from a fire hydrant. The main issue for me is time; I could not even read all of yours and Steve Hays and PeacebyJesus and EA and others (Claude Van Damm) some 500 comments on my "A more honest way of viewing Roman Catholic Prayers to Mary." As for Mark, Silas and Luke, aren't you borrowing from Tradition? "but God always has His mystical body of true believers in history." Kind of like that "remnant" Church PBJ mentioned. Wouldn't you say God has "mystical bodies", in the plural? Like those many remnant churches or pockets of believers scattered here and there throughout Europe and Asia Minor, before the printing press made Bibles available. Trouble is Ken, how did those various and sundry churches maintain unity of doctrine? Were they even aware of one another? Did they all practice baptism of babies? Did they believe in JBFA before Luther? Did any of them pray to saints or for the dead? Sounds like you've read "Trail of Blood". ME-"Can an effect be greater than its cause?" Ken-"God uses fallible humans, prophets, and apostles to accomplish His purposes in this world." Indeed. That body of fallible humans is called the Church. That Church is bigger than the sum of its fallible and sinful parts as it is indwelt by the Holy Spirit. Ken, I understand your theory. But can you give me any concrete examples from history of God working through these Apostles and prophets who were loose canons, working outside the visible Church? How do you, Ken, know how to differentiate between a legitimate development of biblical doctrine and outright heresy? Are you infallible? Does the Spirit testify to you personally and not to the equally sincere folks who might disagree with you on any point of doctrine? How does an invisible body of believers guarantee purity of doctrine? Or do you say they don't have to agree on everything, only the essentials? What are those essentials, Ken? Who decides? Ken, your theory has given us 30,000 squabbling Protestant denominations, all claiming to go by the same Bible. Guy: Me-He promised her success unto the ends of the world knowing the 11 men he spoke to would all be dead shortly. Guy: Thanks for conceding Infallibility to the Church. huh? how is that? All Bible believing Protestants believe in the promise of Matthew 16:16-19 - and Ephesians 3:20-21; that the gates of Hades will not prevail over the church - but that does not mean infallibility or any kind of Pope or magisterium and it does not mean the Roman Church with it's blasphemy of bowing down to bread and wind and to statues of Mary; and its anathema of justification by faith alone at Trent. It became an apostate church at Trent. success in missions and evangelism is still going on to all the nations. But Rome is not doing much Evangelism or missions. Rome is too busy doing ecumenism and saying Muslims worship the same God as Christians and that even atheists will go to heaven by a sincere conscience through no fault of thier own - a direct contradiction to Matthew 28:18-20. "Can you put two sentences together and make an actual argument? Or do you prefer to just stand on the sidelines and heckle?" When the arguments and evidence that you have been presented with are not responded to and your own agenda has been forced onto every thread, I'm content to heckle. Why don't you come on over to Called to Communion or Creed Code Cult. I promise, you will not be received with the same snottiness shown to Catholics on Protestant sites. I've noticed a lot of your comments are hostile and toxic. Any chance you could re-read your favorite verse, Hebrews 12:14, before hitting the "Publish Your Comment" button? Thanks a lot for linking to this translation. I thought I’d have to wait for Maureen Tilley’s translation. This is great. Like you, if only I had more time! As far as I understand, all manuscripts that are extant on the title page have "Kata Markas" and "kata Lukas". When historical evidence does not contradict the Scriptures, there is no violation of Sola Scriptura. I don't mean the "trail of blood" kind of theory. when I say the church existed in the past, I mean the true believers within historical churches. seems to be talking about all believers spread over the whole earth; much bigger than a local congregation. Ephesians 2, and 3 speak of; that is more than a local body.
" . . . just as Christ loved the church and gave himself up for her to make her holy, cleansing her by the washing with water through the word,"
3. Not following Toto (all) of Scripture. I think freedom and the separation of church and state and no more torture is better, even if there are too many Protestant denominations. You are welcome! William Webster mentions Maureen Tilley and quotes from her in his introduction. If you go over to Creed Code Cult right now, you can jump into a conversion of the nature of the Church. Go to the discussion on Daniel and the Kingdom. Eric and Robert are both Calvinists. I hope to see you there (I will not be wearing my Guy Fawkes disguise; plumed hat, boots, tight pants, keg of gunpowder, etc. ). "That Silvanus wrote 1 Peter for Peter is there in the text - 1 Peter 5:12"
Okay,fine. And will you agree the Linus and Clement we see mentioned in the NT are indeed the Popes right after Peter? Get over to CCC and join the fun. Don't be shy. Just barge right in. I just posted on CCC ( under my day-job name ) at 11:12 p.m. Dec.2 America time . It is 7"15 a.m. Dec 3 here in Lisbon. We are arguing about Magisterial reformation confessions and Roman claims. Come on over an comment on what I said or what one of your co-religionists say. You are wanted and welcome. You don't need to give an introduction. Just cut in. This invitation applies to any and everyone else too. ( Just don't give away my secret swashbuckling pen name of Guy Fawkes ). I don't just "jump in" unless I know what is going on. I spent 3 hours reading and because he was mentioned, I also jumped over to Tim Kauffman's website; trying to get a handle on all that. I gave up on reading every word in the middle of the comments at CCC, and jumped around, and saw yours. Kauffman's article on all the debate between RCs on the number of ex cathedra statements was very interesting. that sentiment is exactly what I knew when trying to get a handle on what exactly the ex cathedra and infallibility doctrine of 1870 means. It is nothing and gives no assurance nor does it solve the problem of disunity and disagreement over interpretations, etc. I don't have any more time to spend on Daniel 2, etc. or the infalliblity issue; I just know that the Papal claims are all wrong. It seems pretty clear to me that the 4th Beast is Rome and the great stone that crushed the kingdom is Jesus, but His kingdom is a spiritual kingdom, meaning the Kingdom of God spiritually - people must be born again to enter into that kingdom. I don't think it means what Nick and you and other RCs claim - the Roman Catholic Church. It just means Christianity in general "conquered" the Roman Empire. It began at Jesus' first coming. (Luke 1:26-35; Matthew 21:33-46 - the stone will crush those who don't repent) We are all there in a sense, as the early church was just the early church, not RC nor EO, nor Protestant in the 16 century sense, in the first centuries as "catholic" (universal, according to the whole) Christianity. As the Nicene and other creeds say. Again, the early church is just the early church, not Roman Catholic (arguably from Gregory the Great, 600 AD and beyond, development of exalting Mary behind what is proper, purgatory, and transubstantiation in 800s - 1215, and denial of JBFA at Trent in 1545-1563), nor Eastern Orthodox (1054).
. . . He came up to the ancient of Days"
seems to refer to Jesus' ascension - He is ruling at the right hand of the Father. the spiritual kingdom of God is still growing and the church is still in the process of being purified and reformed, etc. Timothy Kauffman's original article on the "Quid Pro-Quo Canon" - how the Roman Catholics claim the Papacy is so great and infallible and can solve all disunity problems, but they really know what was spoken from the chair (ex cathedra) and what was not. The whole thing is very subjective and anachronistic and doesn't practically do what the RCC claims it does. I don't know who the "lazy boy" is, but Kauffman's article there is good. We are all there (in the early church of the first 500 years; as Protestants, RC, and EO agree on the NT canon and doctrine of the Trinity and first 4 Ec. Councils) in a sense, as the early church was just the early church, not RC nor EO, nor Protestant in the 16 century sense, in the first centuries as "catholic" (universal, according to the whole) Christianity. As the Nicene and other creeds say. "Or SS being possible before Bibles were even available to the average Christian?" My apologies for assuming you had passed CAF 101. Should you decide to make it over to Carm my offer stands. I don't understand why you think the principle of Sola Scriptura could not have been possible before the printing press. Enjoying as you do the consolation of the Holy Scriptures, you stand in need neither of my assistance nor of that of anybody else to help you to comprehend your duty. You have the all-sufficient counsel and guidance of the Holy Spirit to lead you to what is right. NPNF2: Vol. VIII, Letters, Letter 283. There are many more examples of this, in Volume 2 and 3 of King and Webster's 3 volume books, Holy Scripture: The Ground and Pillar of Our Faith. No. They were not Popes; there is no such thing as a Pope in the NT nor in the early centuries. It was NOT until the 9th century that the title of Pope (papa = father) came to be exclusive for the bishop of Rome. bishops in Egypt, Smryna, Antioch, Jerusalam, and other places were also called "papa" = (spiritual) father. The bishop of Rome and bishop of Constantinople anathematized each other in 1054. Cyprian and 86 other bishops rebuked Stephen in 258 AD. Tertullian rebuked Callistus around 218-220 AD. Clement was one of the presbyter-overseers of the college of elders of the church in Rome. presbyters and episcopos are the same office. Titus 1:5-7; I Peter 5:1-4; Acts 20:17 and 28 make that clear. Each church had a college of elders - Acts 14:23 - a plurality - originally, in the NT and the early years of 2nd century. It seems Ignatius is the first to mention a "mono-episcopacy". Did you know that at one time in America priests were called "Mister" and Protestant ministers were called "Father"? And that Catholic priests did not wear Roman collars but Anglicans did? Are you aware that the Copts and others have "popes"? Ken, the practice of calling the Bishop of Rome "Papa" is not important. The reality of the office was there. "Peter has spoken through Leo". "Where Peter is, there is the Church". "Roma locuta, causa finite". Etc Etc. Did Basil say anything else? Did he speak on Tradition, prayers to saints, the sacraments, etc.? I bet he spoke on quite a bit of stuff inconsistent with SS, I don't have to google it and post it for you. Check it out for yourself. As for Mr. Webster's use of the Fathers, you might as well talk to the Jehovah's Witness for anti-Trinity quotes from the Fathers taken out of context. PS, you pulled a no-show yesterday on CCC. Why? There are guys there who you would get along with ( Eric and Robert ). We have them outnumbered and on the ropes. Come on over and help them. The more the merrier. Anyone and everyone is welcome to sound off, just stay a little on topic. I see your comment on Daniel here. Post it on CCC as it is really what the topic is about. We have just wandered off course. By the way, as Nick and I attend Mass at the same parish when I am in America, I can say that without a doubt he would be happy to have you post on his Daniel article. And he would appreciate your thoughts on Daniel as it would bring the discussion back to the original topic. It's not a private party. Crash it. I can't resist. I've gotta say a word on your sources. I don't care if you call it ad hominem. You now mention Tim Kauffman so I assume you have visited his site. I shouldn't say it is his site as a particular internet troll has been pretty much ceded charge of responding to comments. This troll is the only person to ever be dumped from CCC because of his habit of bringing every topic around to priestly pedophilia and mocking the Eucharist. Kauffman, an ex Catholic himself, not only permits this sort of thing but actually eggs the troll on. A quick perusal of the titles of Tim's articles should expose him as someone more interested in giving offense than in actual debate over Catholic/Protestant issues. Certain popular Marian devotions of people like his own Catholic mother seem to be his favorite target. Other than a short debate on the Epistle of James that he had with Nick ( that he excused himself from for indefinite hiatus from and that he has never gotten back to a year ago ), he pretty much avoids any discussion of Reformation stuff. Instead he prefers to traffic in "Death Wafer" and " Bread Worship" rhetoric designed only to inflame and offend. Polite Tim and his troll assistant team up to play sort of a good cop/bad cop shuffle but at the end of the day, he and the troll both are on the level of Jack Chick. Ken, your two prime sources, Webster and Kauffman, are both former Catholics with obvious axes to grind. James Swan has mentioned former Protestants turned Catholic on this blog. Tim Staples is an example. I challenge you, Ken, to scour the net and find the same sort of hate speech from ex Protestants towards their former religion as you will find from ex Catholics. The difference is incredible. And it speaks volumes. Kauffman's article on "Quid Pro Canon" was very good. I have many more sources than just Webster and Kauffman. You have not looked very deeply at my past articles here. Ok, I decided to post a couple of comments there at "Creed, Code, Cult"
What's with Jason's "Drunk ex-Pastors" blog? That does not seem like a good testimony. I know it (Drunk ex-pastors) is meant to be funny; but I don't think it is funny. Getting drunk or close to getting drunk is not funny; and a person becoming an agnostic after being a pastor is not funny. Jason seems to have delegated everything out to a fellow named Jonathan Prejean and another one named Nick. Nick has a blog of his own called Nick's Catholic Blog. Glad you decided to join the fray on CCC. We have pretty much sucked all the blood out of Eric and Robert and need some fresh meat. Ha! It seems like a different Nick, cause "Catholic Nick" also is making comments. There are two "Nicks" there. Yes; that is my point. it was first used for all presbyters/overseers as "spiritual father"; but it never meant the bishop of Rome as bishop of bishops over all other bishops with jurisdictional authority and infallible. It seems to me that, having lost the argument from scripture, you guys then move on to a re-writing of history. The trouble is, none of you, whether 7th day Adventist, Mormon, or any of the various Protestant denominations' theories, can agree on the particular dates and causes. An apostasy of the Church is necessary for all of you. Luther liked Augustine so he wanted to keep him in the pre-Apostasy era. Adventists say the falling away was over the Sabbath. The list goes on and on and is going to get longer. I haven't noticed another Nick on CCC. He should qualify himself so as not to confuse. Right now the conversation is shooting in several different directions. This happens when he or Jonathan stop posting for a few days. Robert is obsessed with Nancy Pelosi and tries using her to prove the Catholic Church is a splintered as Protestantism. Your comments on Daniel will probably get Nick to bring the discussion back to topic. Let's talk about your misuse of history. Judging by what you said about the ( Roman ) Catholic Church as I define it, not existing until a later date, you must think that the Catholic Church had no position on contraception or abortion before Humanae Vitae. In the future, Protestant writers might say that the Church softened her views on abortion in the 1980s when when it was decided that the sin need not be absolved in Confession by a Bishop but that any priest could do it. ( In fact, the sin had become so commonplace that no Bishop had the time to address each case). Because abortion and contraception are so intertwined, it is not always easy to tell which sin is being addressed in certain councils and decrees in Church history. Protestant writers like the fellows you reference could deftly manipulate the evidence into implying that the Catholic Church never had a consistent position on this matter. Ken, doctrines, whether on the Real Presence or Contraception, don't begin with Papal decrees. Rather they are fine tuned and clarified to fit problems and heresies as they arise. Since H.V. even, there have been clarifications and further statements on the spin offs of contraception, such as in vito fertilization and cloning for example. There will be more for sure as time goes on and the " Culture of Death" gains momentum. I offer this as an example of how the Church's doctrines develop over time but never just spring up out of nowhere. This is also a proof of how SS is unworkable. For centuries all Christians were united on this. Now, only the infallible Catholic Church remains true to Bible and Tradition. Anyone and everyone is welcome to sound off, just stay a little on topic. Stay on topic? I'm tempted to log on on as "Guy Fawkes Jr" and and create multiple rabbit trails under every post. I thought there are two Nick's because one has a picture beside it same as the "Catholic Nick" guy and the other does not have a picture/icon. Just because something is specuated about, does not make it truth. Those things/practices/doctrines that Protestants disagree with the Roman C. Church are things that began as speculations / imaginations and then grew into doctrines over time. The church can still exist as the true church but have some wrong doctrines/ practices/ emphases early on. As the false doctrines and man made traditions grew and got worse, the church became worse, culminating in anathemetizing the gospel at Trent. The Roman Catholic way of looking at history is to think everything is there all at once, either heterical or not. No, it is much more subtle than than, and a mixed bag of good and bad. I used to post on his site but stopped as we rub each other wrong and always end up at each other's throats. Why would you be arguing with Kenneth W. if he is a Roman Catholic? "we rub each wrong" - you and Kenneth ? He is Roman Catholic; how is that? or do you mean when you argue with other Protestants? As I am sure you know, the net is replete with new atheist arguments against the historicity of Christ. Some say he was a remake of previous pagan myths, some that he was a mad man or a liar. Some assert he never existed at all. Others say the legend developed in the 3rd century. The veracity of the Evangelists is questioned. Were they deceived or deceivers? Did they exist? What is the actual dating of the N.T.? etc. etc. Both Catholics and Protestants have to show that Christ is historical, and that the Apostles were eye witnesses who accurately wrote down the truth. You guys turn around and write like the new atheists when it comes to the Papacy, Mary and the Eucharist. History shows an unbroken line of successors to Peter. Marian devotion did not evolve out of Isis worship but from seeing Mary as the New Eve and the doctrine of the Real Presence was there from the Last Supper. If you try to debunk the testimony of history when it comes to distinctly Catholic beliefs, you cannot turn around and use the same history to defend the reality of Christ. As I am sure you know, the net is replete with new atheist arguments against the historicity of Christ. Some say he was a remake of previous pagan myths, some that he was a mad man or a liar. Some assert he never existed at all. Others say the legend developed in the 3rd century. History shows an unbroken line of successors to Peter. No. history shows that there was a college of elders first for each church. (Acts 14:23; Titus 1:5-7; Acts 20:17, 28; 1 Peter 5:1-4). elders and episcopos are the same office. 1 Clement shows this also. (44 - where presbyters and episcopas are the same office.) Clement says he writing "for the Church of God at Rome". No claim to mono-episcopacy. Other evidence from Ignatius and Shepherd of Hermas and other indicators show that there was no mono-episcopacy in Rome until after 150 AD. Irenaeus and Tertullian and Eusebius are reading a mono-episcopacy back into 64 AD, after Peter died, up until after 150 AD. Even after mono-episcopacy developed as a practical matter, it became the practice yes, as a matter of history, we don't deny. But even then Cyrpian and 86 other bishops clearly drew the line and rebuked Stephen, bishop of Rome, in 258 AD for claiming to be "the bishop over all other bishops". The east always objected to that, and Von Dollinger, the great RC historian, objected to the 1870 dogma in that it was not from tradition nor the Scriptures, and the arrogant Pope Pius IX said, "I am the tradition!" We don't deny history like the liberals do; but we deny they were correct to claim any kind of Papal doctrine as something that is right or Biblical. Marian devotion did not evolve out of Isis worship but from seeing Mary as the New Eve and the doctrine of the Real Presence was there from the Last Supper. Mary as the New Eve was based on her being the mother of the Messiah and that she was a virgin and brought Jesus into the world. Her as "advocate" was not meant to say we can pray to her; only that she was God's instrument of bringing Jesus into the world. Problem with those statements was saying the Eve was a virgin before sin. True, Eve disobeyed while Mary obeyed, but one cannot prove Eve was a virgin before sin. Genesis 2:24-25 indicate she was not; and she and Adam had a healthy, godly, sexual marriage before sin entered in in Genesis 3:1-8. Later, some others speculated that as Advocate who brought Messiah into the world, one could then pray to her, etc. - that was wrong and we can judge that as violating 1 Tim. 2:5 - there is only one mediator. Nothing wrong with real spiritual presence of Jesus in the Eucharist for believers who confess their sins first and repent and take the Lord's supper in faith as remembering His death and atonement for sins. But it was never meant to be what RCs developed it into, especially from 800-1215 and beyond. Jesus obviously was not doing what RCs claim, on the last supper, when He held up the bread and wine and thanked the Father for them, since He was in His incarnated body, He COULD NOT have meant that the bread He held up and the cup He held up changed into His body and blood, rather that they are symbols of His death and atonement for sin. Wrong, as I already proved above. Only the Scriptures are God-breathed; and historical writings are not, and we can judge what is proper and Biblical and what is not. sorry for mistake about 64 AD - that is more the date for 1 Peter, and 2 Peter around 66-67 AD, so Irenaeus and others are reading the mono-episcopate of 200 AD back into 67 AD to after 150 AD. That makes more sense and accords with the Bible, and shows the whole sinlessness of Mary speculation in later centuries was wrong. All prayers to her was wrong from the beginning and icons and statues in worship context is wrong from the beginning. It is so easy to determine the line where the early church crossed over into wrong human traditions and speculations. The Scriptures keep us in the line/box of sound doctrine. Clement was ordained by Peter. After Linus and Cletus, who were coadjutors with Peter, he assumed office. You keep denouncing a "mono-episcopacy". If you mean by that that there were more than one clergyman in Rome, no problem. Even today, every major diocese has more than one Bishop. However, only one is chief. By the way, someone one this blog said that Paul also had a name change just as Peter did. Not so. Paul is just the Roman form of Saul. It is neither a name change nor a title as Kepha was. You mention Cyprian. You do realize that he was wrong on the issue of re-Baptism and got back in step with Rome, don't you? "All prayers to her was wrong from the beginning and icons and statues in worship context is wrong from the beginning. It is so easy to determine the line where the early church crossed over into wrong human traditions and speculations." Ken, you boldly say that it is " so easy" for you to see where the Church Christ promised to be with and to send the Holy Spirit to "guide unto all truth" got off onto the wrong foot, do you? By the way Ken, do you know who you are talking about? Would you appreciate someone talking about your mother the way you dudes talk about the Mother of Jesus Christ? You are always talking about what a sinner she was. And you insist she had other children. IOW, she was such a ninny that she forgot the visit from the angel and that she was set aside for a holy purpose, overshadowed by the Holy Spirit and made Mother of the Davidic King. You guys say she went on to have a "normal marriage" with Joseph. What a slap in Joseph's face too. You have absolutely no sense of the sacred and project your shallow and base views onto Joseph and Mary. Ken, the lowest street walker,crawling with venereal disease,hooked on heroin, cynical and bitter about life, if she were visited by an angel and told she was going to be the Mother of the Savior of the World, would be so transformed she would never do anything "normal", let alone sinful, ever again, for the rest of her life, what do you think a holy girl who had already dedicated her life and Virginity to God would do? The little children at Fatima and Lourdes who were visited by heavenly messengers retired from life and lived only for God. Our respective views of Mary reflect our respective views of the Church. Our Mary/Church is a consecrated Virgin who remained faithful to her mission. Your Mary/Church was a sinner who went on to have many squabbling and sinful children/denominations. She did not stay focused on her one Son and purity of doctrine. By the way, I have asked James but to no avail, so I will ask you, why have modern Protestants drifted so far from what the original reformers taught on Mary, her Perpetual Virginity and her Divine Maternity? I answered that question under James' article, "Did Luther Think Mary was the Queen of Heaven?" Yes; it is not that hard. The 66 books of Scripture keep is in the line and it is not that hard for those who are born-again, Christ's sheep. We can judge the good in the early church fathers and where they went off in wrong emphasis and speculations. καὶ οὐκ ἐγίνωσκεν αὐτὴν ἕως οὗ ἔτεκεν υἱόν· καὶ ἐκάλεσεν τὸ ὄνομα αὐτοῦ Ἰησοῦν. The purity of the doctrine of the virgin birth, the eternal Sonship of Christ, the incarnation, the Deity of Christ, the 2 natures of Christ, the Trinity, are all held to by Bible-believing Protestants. Mary as a sinner, keeps the focus on Christ as Savior from sin ("My soul exalts the Lord, and my spirit rejoices and exults in God My Savior" - Luke 1:46-47) and the only mediator. (1 Timothy 2:5-6) Your Mary is unbiblical and the statues and icons of her and prayers to her keeps the focus on her and takes away worship and glory to Christ, and distorts true worship, and also gives a bad witness to Muslims for centuries, and still does. So, your argument makes no sense. 12 “I have many more things to say to you, but you cannot bear them now. 13 But when He, the Spirit of truth, comes, He will guide you into all the truth; for He will not speak on His own initiative, but whatever He hears, He will speak; and He will disclose to you what is to come. 14 He will glorify Me, for He will take of Mine and will disclose it to you. 15 All things that the Father has are Mine; therefore I said that He takes of Mine and will disclose it to you." I don't use that name on CCC so it wouldn't matter. Besides, I would tattle on you and the gang over there would take my word over yours. Seriously, why don't we see you posting elsewhere? The sharks would love to interact with you over on CCC. Don't tell me you only post on your own blog? How fun is that? You said that the early Roman Church did not have a "mono-episcopacy". How do you know? As for the offices of presbyter and bishop being the same, well, yes, they are both holy orders but differ in authority. There probably was some development there. I believe you said that Clement was just one of a panel of presbyter elders who ran the Roman Church. Well, Eusebius says otherwise. Besides, even a panel needs one member to supervise. Ken, St. Paul says in his letter to the Romans that they were famous for their faith. Then we see the Roman Church weigh in during the time of Clement in the affairs of Corinth although St. John was probably living in the vicinity. Where else do we see one church involve itself in the affairs of another church? Shortly thereafter, we see Ignatius praise the Roman church for its founders, Peter and Paul. IOW, the Roman church seems to be "special". Then, around 200, we see Pope Victor argue with the eastern churches over the date of Easter. When do we ever see one church ask another church for clarification on an issue or intervene in another churches business? Ken, the reason you don't see the early popes exercising their office like they were to do centuries later is because they were pretty much an underground, persecuted Church for the first three hundred years. "and also gives a bad witness to Muslims for centuries, and still does." What a strange statement. Please explain. It looks like idolatry to Muslims, and they (most Muslims) still think Mary is part of the Trinity (The Qur'an Surah 5:116). You obviously have not read the 6 articles at the end of this article, even though you keep spouting off and commenting. As I said before, you need t research our old articles here. You keep telling us to "google around", but it is you who should do your research, starting with these 6 articles at the end of this article. You keep referring me to articles you have written on various subjects as if your erroneous opinions are magisterial. You seem to forget, I am on the other side. I have no intention of using you as a reputable source. Don't make me laugh, Ken. I will refer you to any of the articles on Fatima and the Muslims on the net. If you think you know so much about prophecy, you just might be interested. Muslims do indeed have a higher view of Mary than Protestants do. Do me a favor. Since I cannot post on Triabologue,( that other source replete with your mental meanderings you like to refer me to ), would you tell Steve that I read his Fahrenheit 451 theory of Bible memorizers. Please tell Steve, in a diplomatic way that doesn't shock him, that that book/movie was pure make believe and that it never happened. Tell him it is almost as improbable as his theory and that SS was impossible before people had Bibles of their own. Don't tell me you only post on your own blog? How fun is that? I post on the CARM boards and Catholic Answers. There are defined rules on these forums, which means your demeanor of dialog would probably end in infractions, suspension, and banning. Excuse me, but I thought this thread was about Peter and the keys. Have you bothered to read what I have posted on the topic? Yes, BOTH Ken and I have gone onto tangents about the rival authority of SS and CCC. Since I am the one singled out as leading everyone off topic, I guess it is on me to bring things back around. Jesus gave the keys to the kingdom to Simon bar Jonah. From then on the others started to call Simon by the name/title of "Peter". The fact that two chapters later Jesus gives all the Apostles, (including Peter ), the power to bind and loose, in no way takes away from the fact that Peter was singled out. Simon's profession of faith did not have it's name changed. Simon, the man, had his name changed. In John's Gospel, Simon's name was changed to Kepha without the mention of any profession of faith. And although John wrote in Greek, he used the word "Kepha". So we need not quibble over any Petros/Petra, big rock/little rock confusion. Peter was the foundation upon which Jesus was to build his Church, along with the Apostles and prophets. Yet he was singled out. Notice, the Church in Matt 16 is the Kingdom. What Kingdom? The new Davidic Kingdom. Now, notice the wording of Is 22:22. See any parallel? Eliakim was not the king. But he was given stewardship. There, James, is that on topic? Now, let's watch and see how the topic is danced around by the Protestants on this blog. I post on Catholic Answer too. I have for about 14 years. I haven't been banned yet. I have to check out this CARM blog I keep seeing mentioned here. Maybe I will grace them with my presence. Maybe we can lock horns over there? You know, on more neutral grounds. Just checking to see how many Protestants had commented on the topic of Peter, the keys and Matt 16. I will spice it up by saying I am aware that some of the Fathers spoke of Matt 16 being about Peter's faith. Protestants like to latch on to this in order to "prove" the passage is not about Peter the man. I would have them check out those same fathers and what else they had to say about Peter. The Church's teaching does not rest on Matt 16 alone. I will check back later to see all the Protestant responses on this topic. James, Still no bites from Protestants. They must be sleeping. By the way, the fact that all the 12, including Peter, received the power to bind and loose or forgive sins in the local churches or bishoprics in Matt 18, does not deflect from only Peter being given the power to bind and loose doctrine in the universal Church in Matt 16. Guy, your impatience makes you look like you prefer to mock rather then debate. You originally posted at a time that is about 2am Eastern today and by 6am you expect someone to answer? Your logic there is flawed if you think that people forsake sleep in order to debate people they may have never met on a blog. Anyways, the issue of this blog post and the issues that you bring up have been covered many times. Sorry but I am unable to click on any of the links you or the other lads provide. That means you will have to speak for yourself rather than sending me off to read someone's tome. "Sorry but I am unable to click on any of the links you or the other lads provide." No apologies necessary, Guy. These links should all be clickable now. Hope that helps. Discussion on Sola Scriptura, canon, and church authority at "Called to Communion"
I see you are a fan of Tim kauffman's. I just posted there a minute ago. C'mon over and enjoy the Falloni Baloney. We are discussing Kauffman's theory that the papacy did not exits until after 350 A.D. Guy, I don't know who Tim Kauffman is and I don't know why you came to that conclusion. Some of the links you provide are off topic. Sorry, but James wants me to stick to Matt 16, Peter and Keys. Go over to Kauffman's site if you want to talk about his articles. Prayers to Mary are also off topic ( although today is a major feast day ). Some of the links you provide are off topic. Sorry, but James wants me to stick to Matt 16, Peter and Keys." Just to clear up any confusion, I provided those links. You had indicated that you couldn't click on any of the links on this thread, so I provided clickable versions for your convenience. You are incredibly lazy; you have yet to even read Brittany Burnette's articles (at Apologetics and Agape) on Matthew 16:18, nor have you read any of the other links that were provided in the original article. You are incredibly lazy; you have yet to even read Brittany Burnette's articles (at Apologetics and Agape) on Matthew 16:18, nor have you read any of the other links that were provided in the original article." He's being disingenuous. Jim / Guy claims to be credentialed to teach spelling & grammar, I have no reason to doubt that and I only mention it to note that anyone familiar with higher education is no stranger to the use of citations of others' work. To then state that he will not refer to material cited in defense of an opposing position reveals a disingenuous motive in relation to a stated desire for dialogue. Lloyd Cradle made a similar move on another thread in stating that he wouldn't interact with anyone using a pseudonym or internet handle rather than their full name. This after interacting myself and zipper. By their fruit you shall know them. I merely said those links on Mary, SS and such were off topic. This thread is on Matthew 16 and the Keys. Whether I look at your links or not is another thing. Either way, I won't be commenting on them on this blog as I intend to not give James cause to accuse me of being off topic again. I repeat but will do so slower this time. I...DON'T...KNOW...WHO...TIM...KAUFFMAN...IS. Seriously, I posted a url to one article that had nothing to do with the gentleman that you're talking about and now I'M the one that's off topic. If you copy and paste the url that I provided, you will see that that article is completely on topic. Way to distract from the actual issues guy. I respect people who say that they honestly don't know and will look into it. People who distract when they are under fire are wasting everyone's time. Please don't call me names. If you persist, I will call you names right back. I said I was unable to click on any of the links provided up until a couple of hours ago thanks to the ministration of EA. I am not lazy nor lying. I don't need to lie, Ken. Not to win this argument on Matthew 16 anyway. Why are you referring me to someone else's writings? You are opposed to Peter being the 1st Pope, right? You should be ready to give a reason for the hope ( or lack of it ) that lies within you. You bet your salvation on the Catholic Church being wrong, yes? Then you should be able to rattle off your reasons at a moment's notice. You have also told me to watch the Rob Zins/Scott Butler debate as your proxy. Why? Ken, Jesus gave Peter the Keys and told him he would rule and watch over the Church. I am betting my eternity on it and am prepared to defend my position. You take the opposing position. Do you even know why? Or do you have to ask Rob Zins? I will tell you who Tim Kauffman is since you don't know. And I will do it slowly. He...is...the...author...of...the...articles...you...refer...me...to. Am I under fire? By you? I want to talk about Peter, the keys and Matt 16, the subject of this blog, with YOU, right now. I don't need to be sent to someone else's blog. Like I said to Ken, if you are not prepared to refute Peter being given the Papacy in Matt 16, step aside and quit wasting my time. Excuse me gentlemen, but I think I will hop over to Kauffman's right now as he is arguing against the papacy from the fathers right now. I will check back later tonight or in the morning to see if anyone has posted anything of their own on this topic of Matthew 16. That should give anybody who cares to rebut my assertions sufficient time to compose something of their own. I deny that Mt 16:18 has reference to "Peter." Most ECF identify either Christ or the confession of Peter's faith as the rock in MT. 16:18. I deny that Mt 16:18 has "exclusive" reference to Peter. There is no "office" mentioned in Mt 16:18. There is no "perpetual office" in MT 16:18. There is no reliable evidence that Peter resided in Rome. There is no evidence that Peter was the "bishop" of Rome. There is no evidence that Peter was the "first bishop" of Rome. However, there is historical evidence that more than one bishop at a time held office in Rome. There is no evidence that Peter ever "ordained" a successor. There is no evidence that the apostles appointed anyone other than Matthias as a "successor". There's no evidence either in Scripture or elsewhere that vouches for a ceremony that transfers "a perpetual office or infallibility" to a successor. My original article was a link to my other blog and it has links to many other articles. They include patient and diligent exegesis and patristic sitations - they include sitations from early church fathers/writers that saw Peter as the rock, Peter's confession of faith as the rock, or Christ Himself as the rock. The fact that you did not even acknowledge that or interact with it SEEMS to indicate that you are lazy, and unwiling to read them. I read them and thought they were excellent and I decided to make a blog article on them. Why are you referring me to someone else's writings? My original article links to Britany Burnette's articles and William Webster's and others. I am referring to them because that is what the original blog post does. Obviously they are a lot of material. Time is the only reason that I don't type it all out in my words here at the moment. You are opposed to Peter being the 1st Pope, right? Yes; there is no such thing as a Roman Catholic Pope in the Scriptures nor in the early centuries. Peter was in Caesarea Philippi, Israel when he spoke those words. He was an apostle, he called himself a "fellow-elder" with other elders of a local church (es) that he wrote to - 1 Peter 5:1-4. If Peter himself is the "rock", then it is him as he speaks the truth - "You are the Messiah, the Son of the Living God"; on that truth, all true churches are built, both Christ as the cornerstone and foundation, and the truth / doctrine that He is the promised Messiah of the OT, and fulfilled those promises, and He is the eternal Son of the Living God. The keys were given to him as a unifying start, because he made the confession of faith first, and then they were also given to all the apostles and church leaders (Matthew 18:18; context Matthew 18:15-20) There is nothing about infallibility, successors, or jurisdictional authority as bishop over all other bishops. The city of Rome is not even mentioned there in Matthew 16. Peter certainly lead the way by preaching the pentecost sermon in Acts 2 and opening the door to the Gentiles in Acts 10-11 and 15 (Acts 15:9 - they are saved in the same way we are, cleansing their hearts by faith). Peter probably went to Rome later as an apostle/missionary/evangelist, but he was not a bishop there. When they preached the gospel truth, they were using the keys to open the door for people to enter the kingdom of God. All who believe in Jesus as the Messiah (fulfillment of OT (Genesis 3:15; 12:1-3; 22:18; 49:10; Isaiah 49:6; Psalm 2), suffering(Isaiah 53), atonement for sin(Isaiah 53, Daniel 9:24-27, Psalm 22), resurrection (psalm 16)) and the eternal Son of God, can preach the gospel and open the door to the kingdom, that is use the keys. The elders/overseers have the keys in Matthew 18:18 to do church discipline. Same in John 20:23. You should be ready to give a reason for the hope ( or lack of it ) that lies within you. You bet your salvation on the Catholic Church being wrong, yes? Then you should be able to rattle off your reasons at a moment's notice. I just did; again. A lot of that I already wrote before, in interacting with you. It's 3 hours or more; lots of details. It is too much to type out. It would give you a basis for discussion. Oh well. I tried. It seems you have never even listented / read any of the Evangelical Protestant writings on these things. Ken, Jesus gave Peter the Keys and told him he would rule and watch over the Church. Yes, (except there is no "rule" in the RC sense, and he does not "watch over the church"; but elders of biblical churches today preach and teach and lead and counsel and shepherd the flock) and also to all the other apostles and presbyters in local churches also have that authority in Matthew 18:15-20 to do church discipline and preach the gospel. I am betting my eternity on it and am prepared to defend my position. You take the opposing position. Do you even know why? Or do you have to ask Rob Zins? explained above, and many times before. James Swan just wrote an excellent article on how to read a blog post and make constructive comments. You need to show you actually read the whole article and links (at least quote from an interact with some of the links provided.) When an author writes a blog post and links to other articles, he expects the commentor to interact with the links. Show some quotes and make argumentation based on content. I will tell you who Tim Kauffman is since you don't know. And I will do it slowly. He...is...the...author...of...the...articles...you...refer...me...to." No I didn't, look again at my post. There's only ONE url and it was to an article authored by William Webster. If you can't access it, that's fine. But when you have been making so many errors, it would take too much time for me to correct you. I can't make comments all day, I have a family, work, and other priorities. If you can't tell the difference between EA and myself, that's your problem. There's only ONE url and it was to an article authored by William Webster. Guy appears to be obsessed with Tim Kaufman, a name I never heard before Guy began chanting it repeatedly here on this blog. If he wants to fight with Tim Kaufman, then he should go to wherever this person is. 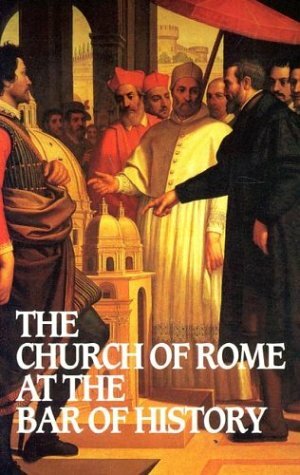 On the other hand, William Webster has done some great work on dismantling Rome- thanks for posting links to his work. "If he wants to fight with Tim Kaufman, then he should go to wherever this person is. " He has. And his interactions are in the same vein as here. Do you know that the power to bind and loose doctrine can mean to absolve from sin and bind doctrine? Peter was given both. And the name change from Simon to Peter is important. Who else had their name changed in the Bible? "Do you know that the power to bind and loose doctrine can mean to absolve from sin and bind doctrine? Peter was given both. And so were the rest of the Apostles. Further, binding and loosing has to do with declaring what has already been declared in Heaven. It does not, as many people think, mean that God is bound by some declaration on Earth. "Who else had their name changed in the Bible?" Yes, and always for a purpose. As we see in Kecharitomene. Simon was called ROCK because he was to the Rock upon which Christ would build His Church. The Foundation. "Yes, and always for a purpose. As we see in Kecharitomene." Well it looks like we've reached the tendentious assertion phase of the thread. No, Mary was not renamed by the angel Gabriel. Even Jimmy Akin admits as much. "Simon was called ROCK because he was to the Rock upon which Christ would build His Church. The Foundation." The Rock upon which Jesus Christ builds His Church is NOT Peter, it is the confession that Jesus Christ is Lord which comes about by a conversion that is the result of a prompting by the Holy Spirit. But now we are getting off topic. Did Simon the man have his name changed or did his faith have its name changed? I clicked on the link leading to Brittany Burnett's article and tried out my "low aptitude for reading" as James calls it. Ms B says Matt 16 speaks of Peter's profession of Faith and not Peter the man being the Rock. She sights Origin, Ambose, Epiphanius and Chrysostom as sources. Fine. But perhaps the lady should have included some of the other things those four writers had to say about Peter being chief Apostle. For example, Chrysostom says a lot about Jesus giving His sheep to Peter. Ambrose is famous for saying, " Where Peter is, there is the Church". Ambrose also didn't like the way James, Cephas and John were mentioned in Paul's epistle so he changed it to Peter, James and John saying the older manuscripts acknowledge the proper order where Peter is first. Origin says, speaking of Peter, "Upon him, as upon the earth, the Church was founded". He also calls Peter, ' "The Prince of the Apostles'. Epiphanius calls Peter, "The first of the apostles". I could say much more but that should suffice to show that Matt 16 and Peter's profession does not take away from what the Fathers had to say about Peter's primacy. You started on Brittinay Burnette's article (or one of them), but you are showing that you didn't look very closely at all of her articles. She actually has 5 different articles on 3 "schools" of interpretation in the early church fathers. She goes through the Petrine school (that the rock is Peter himself) - 2 parts - Cyprian is very important in part 2. The Christological School - that the rock is Christ. The Fide / Confession of Faith school - that the rock is Peter's confession - "You are the Messiah, the Son of the Living God"
The point I am making is that she was very thorough in giving us all the information. Webster does the same thing in his article, but in a different order of citations. Since you are familiar with Scott Butler's material, you will see that he addresses this stuff about how to interpret the Rock. The same Father's that spoke of Peter's faith being the Rock just so happen to be some of the staunchest supporters of the Petrine Office. Not one Father before the 5th century interpreted it as Jesus being the Rock. By the way, any confusion about Petra/Petros can be thrown out as Matthew was written in Aramaic, not Greek. Several Fathers say so. More than once on this blog the case of Cyprian has been appealed to support Protestant assertions. I find this strange as the very fact that the dispute was between two different sees. It seems, as in the case of Clement and Victor, only Rome felt authorized to intervene in the affairs of other bishoprics. Later when disputes did break out between, lets say, Antioch and Alexandria for example, on the natures of Christ or the Trinity, Rome was the see appealed to for a verdict. And of course, Rome won the dispute with Cyprian the rigorist. Protestants always seem to forget this point. Tim Staples says otherwise. Click on Catholic answers archived show for Dec 9 just a couple of days ago. But now you have taken us off topic and I can expect a writs slapping for it. As I said earlier, you can cut to the chase , past all this stuff and just realize if Peter was the chief Apostle, and the Apostles ruled the Church ( infallibly ), Peter had to have that charism in the fullest degree. You however insist that the Church founded by Christ is not infallible and has even failed in some sense. Ken, if the universal Church can err, every single denomination can err and that means every single individual Christian can err. What's left? Without a Rock foundation, all you have is shifting sand. You have no "Pillar and foundation of truth" upon which to base your faith. You cannot know the Bible or any doctrines, including the divinity of Christ with any assurance. Lets nail the lid down on the coffin of using Cyprian to support Protestants claims. Read what Cyprian said to Pope Cornelius for a clear understanding of Cyprian's views on the Papacy. He says to be in union with Pope Cornelius is to be in union with the Catholic Church. He calls Rome the "root and mother of the Catholic Church" and the "Chair of Peter the source of unity". Even after the martyrdom of of Pope Fabian, when the Chair was vacant, Cyprian wrote to the clergy of Rome for advice on a dispute. As for the Rock of Matthew 16, Cyprian explain that all the Apostles were given authority but Peter was singled out. Augustine assures us that the argument between Cyprian and Stephan did not breech the bonds of unity. I am taking this from Cardinal Merry Del Val's book, "The Truth of Papal Claims" copyright 1902, that I have here in my hand. Again, Cyprian was wrong. The Church does not rebaptize. End of story. "On the other hand, William Webster has done some great work on dismantling Rome- thanks for posting links to his work"
Ken seems to concur so I will make a few short remarks. Earlier I mentioned that I don't care to respond to material put out by Mr. Webster and was ridiculed for my "ad hominem" attack against the man by Ken although I did not even say why I don't bother with Mr.Webster. Perhaps it is time for me to explain. I have never met the man vis-avis. However, we used to speak on the phone and exchange snail mail when I lived in Oregon. ( Remember, I am almost computer illiterate ). Webster used to put out material saying that Cyril of Jerusalem rejected the deuterocanonical books. I corrected him over the phone and at first he did not want to believe that Baruch was listed by Cyril as canonical. But he acquiesced on the phone. Webster also used to put out stuff about the Pope condemning the doctrine of the Assumption. He was corrected and told the Transitus material was suspect but not Mary's Assumption. Although corrected, Webster, who used to make money from his books and cassettes, continued to put out the same false information on these subjects. At least, he did not retract. Note that I say " used to" as I stopped paying attention to a man who chooses to obfuscate rather than concede a point when corrected. His anti-Catholic spiel gets results so why correct any mistakes, huh? I don't know why Webster did what he did and perhaps he has since corrected his material, however long overdue. Some professional anti-Catholics cannot afford to lose the revenue by retracting false material against the Church if it sells well. Here is a recording from a Protestant source ( Larry Wessels ) featuring a discussion between myself and professional anti-catholic Robert Morey that admits the dishonesty of some anti-Catholic bigots. I am not saying Webster is motivated by money. ( I have another theory on that issue.) What I am saying is he is as uninterested in accuracy as Robert Morey is. Most anti-Catholics who make it their life's work to trash the Church are not acting in good faith, in my experience. So you can thrust his material at me all you want and I will continue to ignore his bamboozling. Robert Morey has been discredited for a long time. I was not impressed with his "Islamic Invasion" book when it first came out, and his "moon god" theory is not very credible either. The video documents Morey's mistake on "Bloody Mary", but there is nothing about William Webster there, so I did not get the connection. You need to provide the exact quotes, page number, etc. from Webster on the Transitus literature and the Assumption of Mary. Your style is not very good - you provided a video on Robert Morey, but that had nothing to do with William Webster. Peter was the informal leader with a leader-type personality, sure. The Lord revealed to his mind and heart that Jesus was the Messiah, the Son of the Living God - yes; in that sense, he was the first to get that foundation doctrine, and from those truths - the truths of who Jesus is - every local church has to hold to those sound doctrinal truths in order to be a true church. But there is no infallibility nor "charism in the fullest degree" stuff. slowly, false doctrines entered in; but they were still the churches in history; with flaws and some false doctrines (baptismal regeneration, mono-episcopate, penances rather than repentance, later - prayers to Mary, etc. much later - 400s onward, speculations about purgatory (really 600 AD onward), etc. The complete failure was not until Trent (1545-1563)when they condemned the doctrine of justification by faith alone, but Transubstatiation was also very very bad in 1215 onward, it's development from 800s - 1215). What's left? Without a Rock foundation, all you have is shifting sand. You have no "Pillar and foundation of truth" upon which to base your faith. You cannot know the Bible or any doctrines, including the divinity of Christ with any assurance. False, it is right there in the book of 1 Timothy (3:14-16 - "I write these things to you so that in case I am delayed, you may know how to behave in the church of God, the pillar and buttress of the truth." ) and all the other 66 books of the Bible. Local church leaders who are accountable in a college of elders and who hold to the faith once for all delivered to the saints, doing sound exegesis and preaching and teaching, holding to the gospel and justification is by faith alone, not by works; but that sanctification is by faith and diligence and effort in good works and perseverance. Read what Cyprian said to Pope Cornelius for a clear understanding of Cyprian's views on the Papacy. He says to be in union with Pope Cornelius is to be in union with the Catholic Church. Where is that? Please give the reference, preferrable at the ccel.org site. He calls Rome the "root and mother of the Catholic Church"
again, please give the reference. and the "Chair of Peter the source of unity". Yes, in his "the Unity of the church"; but that just meant all the bishops everywhere who hold to the faith of Peter, to his confession and doctrine, all bishops together are in that unity. no problem. Protestant ministers and elders who hold to the doctrine that Peter spoke are also in that unity. But nothing about the church or city of Rome. Again, please give references, but that doesn't prove anything about a Papal office or infallibility. The articles that I linked to give references; you don't seem to give references in your assertions. No, Cyprian and 86 other bishops were right on that; that each local church could decide, based on the individual circumstances, if they should be re-baptized or not and what level of repentance and restoration and time-period of probabation would be taken in discipline. Heretics and heretical churches are different from weakness under torture or persecution. If a Mormon gets baptized in the name of the Father, the Son, and the Holy Spirit, and then comes to faith later, does the Roman Catholic Church rebaptize? As a Baptist, I have no problem with re-baptism. I reject infant baptism; and so if a person comes to faith later in life, and wants to be baptized properly (after repentance and faith), then that is good and Biblical. But if a Presbyterian or other sound Protestant church member later, because of various circumstances, becomes a member of our Baptist Calvinistic church, if their personal conviction is that their infant baptism was their valid baptism and to get re-baptized would violate their conscience and violate Ephesians 4:5 (one baptism), I would not require them to get rebaptized. Pastoral ministry has the authority to make those case by case calls. If Cyprian and the 86 bishops were right, history has sure dealt them a low blow as Stephan won the dispute on Baptism. Your views are not those of the Catholic Church, then or now. One can be reborn only once. If one falls into sin or heresy after that, they can be restored to grace and faith but they cannot be born again. The Cyprian incident helped the Church to define herself on the Sacraments. More was to come, especially with Augustine's views on the Sacramental Seal. Baptism means to dye or pickle, not just to immerse. A vegetable cannot be re-pickled, a piece of dyed cloth can get dirty and need washing. But it isn't re-dyed. Three Sacraments, Baptism, Confirmation and Holy Orders give put an indelible mark or Tau on the soul. It remains forever, even in hell. The word derives from the brand or tattoo given Roman soldiers that marked them as the emperor's men. It could be a mark of honor or, if the soldier deserted, a mark of shame. Either way, it was permanent. As for Baptisms performed by Mormons, they would be invalid because they have an explicit intent to do something other than "what the Church does" due to their views on the Trinity. Even a Jewish doctor can Baptize a newborn in danger of death. All the doctor needs is an intent to do what the Church does. The Sacrament is not dependent of the faith or holiness of the minister. The only time the Catholic Church re-baptizes is in cases where validity is suspect. That is called conditional Baptism, Otherwise, re-Baptism is a sacrilege. I cannot reach through cyberspace and hand you the book I have here. You have a computer. You have access to a library. Ask Webster via email or even phone call. I assume you know him well enough to phone him. I am not lying. I assume you aren't either. Ken, your references are links to other people's articles, some of them quite lengthy. Just giving me titles of other peoples tomes is hardly fair. Would you like it if I said, " Go read the Summa"? And then called you "lazy" when I discover you have done it? You are a minister right? Don't you have access to Lightfoot's works on the Fathers? One of my sources here in Jurgen's. Another is Butler's. They are available in every Catholic bookstore or library for fee perusal if you question my honesty. The video was all about Webster and his style. Once again, scrounge around among his materials. You are there in America and can find them in Protestant bookstores. What does he say about Cyril and Baruch? What do YOU say about Cyril and Baruch, Ken? A few years ago, for some reason that escapes me now, I googled him and emailed him. He was still on the anti-Catholic circuit. ", doing sound exegesis and preaching and teaching, holding to the gospel and justification is by faith alone, not by works; but that sanctification is by faith and diligence and effort in good works and perseverance." Now, who needs to give references? Justification by Faith Alone? That is not the Gospel. The video was NOTHING about William Webster. only about Robert Morey - and he has discredited himself. You did not advance the conversation at all my friend. I am familiar with some of Cyprian and the unity and the chair of Peter concept, and Cyprian and 86 other bishops believed that they were ALL in unity with Peter's faith (in Christ, the Messiah, the Son of the Living God) in their respective areas and that all the bishops together constitute that unity; but they disagreed with one bishop, namely Stephen, who claimed to be "bishop over all bishops". You lost the debate, Guy; because you don't provide documentation of your major points. There are five articles on Justification by faith alone under the side bar, "labels" and 42 on justification. I wrote 4 of them and James wrote 1 in the "justification by faith alone" label. several about the famous statement that Allistar McGrath said - about "a theological novum"
Find it there and point me to it, if you can. newadvent (the Roman Catholic site) ?? This is about your assertion that saying Cyprian felt all the Apostles had equal billing alongside Peter. It is taken from Jesus,Peter and the Keyes by Scott Butler page 306, quoting De Catholicae Ecclesia Unitate.
' Moreover,..to carry letters from profane men to the chair of Peter and to the principal Church, whence the unity of the priesthood took its rise; nor do they consider that the Romans are those the whose faith was praised by the Apostle TO WHOM FAITHLESSNESS CANNOT HAVE ACCESS". Ken, the Pope is a Bishop, no more or less than any other Bishop goes as far as priestly power is concerned. You seem to think that because there were 11 other Apostles and later many more bishops, that it takes away from Peter and the Papacy. I just clicked on the New Advent site ( I see the other one is Philip Schaff, a protestant ) and see I could have just copied and pasted what I so painstakingly typed above. IOW, you had access to the quote all along and so I needn't have gone to the hassle of playing you game of bogging the discussion down unnecessarily. So, read the article on New Advent for yourself and spare me from having to dredge up chapter and verse for you. Unless you mistrust it. I understand if you do as I don't trust Schaff. I don't care if any of the Fathers have been translated into English. I am not a Protestant who is trying to reinvent the wheel and depending on myself. I am not my own Pope. The Catholic Church has a few smart cookies who read Greek, Latin, Hebrew, etc. I trust them to do the foot work for me. I was musing earlier today about your demand that I document ever utterance I make. I remembered an interdenominational Bible study my wife and I attended for a while here. It was given by the NATO disbursing officer who happened to be a Protestant minister. Various denominations were there. I found it so frustrating that no matter if I said something as innocent as "Jesus walked on water", the Protestants wanted chapter and verse and would check it out in all their various versions of the Bible and compare and fret over every single word. It took forever to get anything accomplished in the class because of the obsession with seeing everything in print for themselves, even when they knew that Jesus had walked on water themselves. My wife and I thought they mistrusted us but now I see it is how you guys study anything. I thought it was just nutty but now, I think I understand better. It is a Protestant thing, huh? It is how you are trained. We Catholics just assume our teachers know what they are talking about and accept it without question. Yes, I know the Cyprian quote. I told you I know that passage, but I did not have the Cornelius one you mentioned. The Cyprian says nothing about a superiority of jurisdiction above the other bishops. The primacy of Peter was one of honor - "first among equals" - (same historical view that the EO has had from beginning - no Pope or bishop over all the other bishops. Sorry. primacy of honor because Peter spoke the truth of the doctrine first. You are grasping at straws. William Webster discusses the Cyprian passages very thoroughly in those articles that I linked to. It is your loss for NOT studying deep enough. We have the true faith of Peter because we believe Jesus is the Messiah and the Son of the Living God- Protestant churches who teach that are teaching with that same authority that the early church in history called "the chair of Peter" - all it meant was when the pastors taught the true doctrine. It's not a biblical thing, rather a historical development thing. we don't add man made traditions like Mary and Popes and indulgences and treasury of merit and purgatory and statues and relics and rituals and hail Mary's and bowing down to bread and wine, thinking it's Jesus. You have added so many corruptions and traditions of men (Matthew 15, Mark 7), that even Peter's doctrine is eclipsed out of the heart and minds in Roman Catholicism. I have been perusing the Brittany Burnette material on the 3 interpretations of Matt 16. and find this interesting. "Clearly, there is a major shift between the two versions. The first version does appear to assert Roman primacy. This primacy text goes on to state that Peter was the chief of the apostles, and there is only “one chair” of Peter. This would seem to indicate at Cyprian might, at the very least, be sympathetic to a papal claim to the chair of Peter. If Peter has primacy over the other apostles, and the pope has assumed the apostle’s chair and his authority, then the pope is in a position to wield considerable power over the Church. " I am not saying anything more than that the lady concedes Matthew 16 was seen as a support for Peter being the Rock. Since we are lobbing material at each other, here is one for you. James has accused me a few times of an inability to stay on topic so I am hamstrung. "we don't add man made traditions like Mary and Popes and indulgences and treasury of merit and purgatory and statues and relics and rituals and hail Mary's and bowing down to bread and wine, thinking it's Jesus. You have added so many corruptions and traditions of men (Matthew 15, Mark 7), that even Peter's doctrine is eclipsed out of the heart and minds in Roman Catholicism. Ken, I told you that I don't think Webster is moved by money. I say the same for Tim Kauffman who I believe was Webster's understudy. There is a guy on utube and elsewhere named Paul Vitz. He is a headshrinker and has written quite a bit on the psychology of atheism. He profiles the great atheists of history, Voltaire, Hitler, Marx, Nietzsche etc., especially Freud, and their relationships with absent, weak or cruel fathers. Check him out or see his book, "The Faith of the Fatherless". ( He doesn't address how many of the great atheists were either the sons of Lutheran or Calvinists ministers or had studied for the ministry themselves. Art Sippo speaks to that issue. But now I digress ). Hatred for God is hatred for the father. Hatred for the Church stems from a similar attitude toward the mother. There, I said it. My amateur psychiatrist theory on Webster and Kauffman is this; They, like Luther ( who didn't visit his mother on her death bed ), have emotional issues rather than theological. I base this on statements made to me. In Webster's case, it was in a private phone call so I won't repeat it. Kauffman's horrendous views are posted on his site for all to read. If you click on Kauffman's site you can see his views on the Papacy. Neither you nor Brittany Burnette would go so far as he does, by any means. As wild eyed as his theories are, he can't be budged by any correction ( He doesn't even believe Peter was the Bishop of Rome and insists the office did not exist before the latter part of the 4th century although he quotes the fathers left and right ). Although I am a frequent visitor on the site, I have long since quit bothering to really read, in any detail, a word he says as I mistrust very word, every quote, every reference he gives. I am convinced his motives, like Webster's are based on hate. Hatred makes it easy to justify any means to accomplish an end, including telling half truths, obfuscation and withholding facts. ( I have caught both men in the act ). The motive to destroy the faith of Catholics by lapsed Catholics is demon inspired ( IMHO. So, keep badgering me about Webster if you want. It will be a cold day in July before I give him any credence whatsoever. End of discussion on the matter. If you don't want my "ad hominems" don't push Webster in my face. ( And to think, we have never discussed Webster's side kick, renegaed priest, Richard Bennett and what he has/had to say. I knew him too. ). This is not off topic as I am addressing Webster's material on the Matthew 16. "We Catholics just assume our teachers know what they are talking about and accept it without question. Every once in a while Guy makes a statement with which I cannot disagree. To keep this in context with repect to the rest of thread, if Mt. 16:18 indicates an infallible teaching office in perpetuity and further dogmatic pronouncements such as Vatican I describe the conditions that must be in place for infallible pronouncements to be promulgated, then that explains why a Catholic could have certainty regarding infallible teachings. I don't agree with that, but for the sake of the conversation, I'll concede that that suffices for the Catholic. However, what assurance does the Catholic have outside of infallibly defined doctrine that their "teachers know what they are talking about"? Teachers could be anyone in the RCC from members of the Magisterium to the CCD teacher. She talks about how "later" Fathers used Matt 16 to promote themselves. Yes, well, she should acknowledge that it wasn't until the 5th century that a "later" Father interpreted the Rock to be Jesus. Anyway Ken, none of the various interpretations really undermine the Catholic position as Brittany's articles show Rome can live quite happily with any of them. You guys accuse of of saying Peter is the Rock and Jesus isn't. Not at all! No more than Peter is the shepherd and Jesus isn't. Whether it is walking on water, shepherding or being the Rock, it is always dependent of Jesus. You guys put up the false dichotomy, we don't. This is a bit like the ruckus over the Woman of Rev 12. Is she Mary? The Church? Or Israel? We say all of the above. I will remind you that Jn 1:42 says Simon the man is Kepha. No profession of Faith mentioned at all. Still, in Matt 16 it was only Simon who was singled out by the Father for the revelation upon which he made his profession just as only he was singled out for the revelation of the net. Why do Protestants make it an either/or issue? The profession of Faith vs the man who made it? I am sure you know more about the debate on whether Mark or Matthew or Quelle has priority than I do. But do you know how this all started? Bismark ordered the German universities to start stressing a Markan priority in order to undermine Matthew 16 during the infamous Kulturekampf. Check it out for yourself. You might find the story interesting, especially if you have German ancestry. It explains why so many Germans emigrated to America in the late 19th century. Finally, if all the Apostles were equally rocks, why weren't they all given keys? And why does history have so much to tell us about Peter and the Roman see and practically zero on, lets say, Bartholomew, Philip or Simon the Zealot? Why did Antioch, Alexandria and even Jerusalem take a back seat to Rome? It wasn't because of any powers of military coercion. Later, when Constantinople tried to usurp the Petrine claims because the emperor relocated there, it was quickly dismissed by saying Rome's clout came from being the city of Peter and Paul, not the seat of the Empire. In order to support their claims, they switched to saying that Constantinople's bishopric was established by Andrew, Peter's brother. All the Patriarchates needed an association with Peter to establish their authority. Alexandria was founded by Peter's secretary, Mark. Antioch was where had Peter ruled and Jerusalem too. Rome is where he suffered. Those are the facts of history Ken. I ain't making it up. "Finally, if all the Apostles were equally rocks, why weren't they all given keys?" They were. See Mt. 18:18. All of the disciples are being addressed by Jesus here. It says they were given the power to bind and loose. No keys mentioned. By they way, peter is one of the 12 mentioned here too, right? So why the singling out two chapters earlier? Because Matthew 18 is dealing with disputes between Christians and absolving from sins as we see in John's upper room scene where Jesus breathes on them and tells them to bind or loose consciences. If a brother won't listen to the church's decision, he is to be treated as a publican. Clearly this is talking about the local church community only. Jesus does not say, "My Church" as He has only one Church. Matt 16 is about the one Church that all the local churches are members of. It is about doctrine, not about settling disputes or hearing Confessions. By the way, never say never. I was doing a little more reading on Brittany Burnette's stuff, clicked on something with led me to click further and found this article made especially for you Ken. In her article on the nature of the Apostolic office, Brittany says the majority of both Protestant and Catholic scholars say Peter the man is the Rock. However, she says there is no reason to see that office as having any succession. Then why did Jesus bother to set it up? For one generation only? Was the power to bind and loose only temporary? Was Baptism and the Lord's Supper meant to be continued? Were Bishops to end with the death of the Apostles? Dallas Theological Seminary, eh? It is easy to see how we all don our confessional spectacles when we read scripture. You are assuming that "Peter as the Rock" is a Papal office. Peter was an apostle, and the apostles appointed elders (presbuteroi) / episcopoi (overseers or bishops) for every church (Acts 14:23) in every city (Titus 1:5-7). Peter calls himself a "fellow-elder" - 1 Peter 5:1-4, and so there are of course supposed to be elders/overseers for each church in every successive generation. They are to teach and lead the local church and preach the gospel and hold to the faith and do church discipline. (Matthew 16:18-19; 18:18-20; 1 and 2 Tim. and Titus) But there is nothing in that that is the Roman Catholic way of seeing it as something like a "charism" of anointing of oil that passes down with the laying on of hands, infallibility, ability to interpret infallibly, etc. There is no Papacy nor bishop over all other bishops in that, and no guarantee of infallible interpretation or jurisdiction over other areas. As the church grew into different areas, there is where we see these issues of the controversies and disagreements of bishops with each other in different ares. Jerome even admits that the change from a college of elders for each church to the mono-episcopate was a practical decision of "custom" - (Jerome, Commentary on the Epistle of Titus, PL 26:562-563; Perspectives on Church Government, 5 Views; Edited by Brand and Norman, chapter by James White, pages 251-252.
for the elders/teachers/overseers for each church - the power to teach, preach, and bind and loose in church discipline is continuous; but that in no way says anything about a Papacy, mono-episcopate, infallibility, authoritarian jurisdiction over other areas, automatic anointing just by laying on of hands, etc. Was Baptism and the Lord's Supper meant to be continued? Yes - but not baptismal regeneraton and not Transubstantiation. Were Bishops to end with the death of the Apostles? That still says nothing about the Papacy, jurisdictional authority, automatic succession of apostolic authority, infallibility, nor infallible interpretations. Nothing. So, your argument has failed. You actually try to harness Jerome into your camp? This is a classic example of my pet peeve. It does not matter if some fathers said this or that on Matthew 16. The Church has defined the meaning of very, very few passages of the Bible. We don't take everything we believe on the Papacy from Matthew 16. Forget Matthew 16 for a minute and answer some simple questions. Which see was primary in the early Church? Next, how did that principal church exercise authority? Militarily? Financially? How did that church bully or intimidate the other sees? How is it she had the chutzpah to weigh in on issues in Corinth, the East or Carthage? Remember Ken, every pope for the first 300 years died a martyrs death. ( I have stood in the very spot where Fabian was beheaded when burst in upon while saying Mass ). The Emperors did not obey the Popes and enforce Papal power. No way! The Church was underground. Again, remind Brittany ( if you have contact with her ) that in John's Gospel, Jesus told Simon the fisherman he ( not his profession ) would be called Kephas long before the profession of Faith incident in Matthew 16. OOPS! You have been getting lost in the shuffle. I mistakenly attributed your comment to Ken and answered your Matthew 18 commentt there. Why would Jesus set up a bunch of squabbling local branch churches with no more central authority than the myriad Protestant denominations share today? The early Church was ONE in dogma. Protestantism is hardly one on anything. Even your twin pillars of SS and JBFA are meaningless bromides. No two denominations interpret the scriptures uniformly and you, as a Calvinist have a view of JBFA that most Protestants abhor. Jesus set up a Church to last. Not o just to operate until the New testament books were written and then step aside to the dictatorship of relativism that comes with SS and private judgement. As for your comments on Transubstantiation and Baptismal regeneration, I would love to take the bait but will exercise heroic restraint for the time being. I have to say more on your attempt at commandeering Jerome to support your views on the Papacy. It is like Ms. Brittany trying to commandeer particular fathers, due to their spin on Matthew 16, as proof of the Protestant denial of the Papacy. Even Kaufman, who hates the Church, would probably not attempt to call on the name of Jerome as he says Jerome was a complete heretic to the gospel and sell out to the Romish system. No doubt you have studied some on the development of the canon. You may know that Jerome, influenced by the Rabbis he studied with, was the first Western Father to denounce the Deuterocanonical books. He even called them "ravings". He broke with Tradition and didn't want them in the Bible. They are in our Bibles, Ken. And Jerome put them there. Why? Because he obeyed the Pope. But now we are getting into the issue of the Canon of scripture which is for another time. Perhaps you have read of the Council of Sardica? Around 340ish. It said Bishops were not to meddle in the affairs of other bishoprics. An exception was made for the successor to Peter in Rome. About 25 years later, a dispute on how the Cappadocians were to understand the terms "essence" and "hypostasis" arose in the East. In compliance with the above, Jerome said they had to appeal to the Chair of Peter for a decision. It is not honest for Brittany, Kauffman, Webster or you to trot out an isolated quote from Jerome or any other father for support on Matt 16 ( for example ) or whatever if you really know in your heart that that Father believed in the Papacy. It is bamboozling, pure and simple. It may be a clever debating ploy in the short run but it is hardly worthy of Christians in search of the truth. Rather than take umbrage with my statement on the disparity of views on any doctrine among "Bible Only" folks, remember your comments about about a Presbyterian Calvinist entering your Baptist Calvinist fold and whether or not he would be re-Baptized. We are free to test every early church writer and see if they are Biblical. When they are biblical, we accept them on that issue; when they are not we reject their view on that specific issue. For example Tertullian was right about Mary having other children after Jesus; and he was right to encourage baptism later as they are growing spiritually and knowing Christ. but he was wrong on venial and mortal sins and penance (rather than heart repentance) and other things. But Tertullian was right on the phrases of "Trinitas Unitas" and "one God in essence in three persons". Jerome was right on the Apocrypha, and the statement I referred to above that elders and bishops are the same office, but he was wrong on the Perpetual virginity of Mary and his attitude towards women and denigration of Marriage. Cyprian was right in his stand against Stephen, but wrong on priests. Origen was correct that Mary had sinned, but he was a heretic in thinking the unbelievers will eventually be saved, and even the devil; and he was wrong to castrate himself. And Origen was wrong on promoting the allegorization method of interpretation, but correct on Matthew 16:18. (that the rock was the confession of Peter's faith in Jesus as Messiah and Son of God. Augustine was right on many things, but wrong on allegorization of parables and narrative texts. So, yes, I can cite Jerome for evidence of our understanding on this. We can use our brains and discern what is Biblical and what is not. And this is based on whose reading of the Bible? Yes, keep using your brains, Ken. You guys using your brains, and attributing every contradiction imaginable to the inspiration of the Holy Spirit, has got you guys disagreeing on whether Baptism is important or not, even among two denominations that consider themselves both Calvinists. Jesus's infallible prayer was that His followers all be one in doctrine. You disagree with most Protestants on what is in scripture. I assume you are smart enough for government work. And sincerely seeking. I have no reason to assume otherwise. I also assume Church of Christ folks, Methodists, Lutherans and every little non-denominational out- fit meeting in a living room or store front are too. You all have Bibles. And Brains. Are you all "Church"? Despite what you have to say on how one gets saved? Are you all right when some of you say Jesus died for all and others say he didn't? You can't all be right on whether God makes men for hell "according to His good pleasure", commands them to obey the commandments, withholds the grace necessary for them to do so and then "justly" condemns them for failing, can you? Are you and Lutherans both right on the Eucharist, Ken? Even Once Saved Always Saved folks don't necessarily agree with the other 4 points of Calvinism. Is Jesus Savior Only or must He be Lord too? Some good folks say John MacArthur sold to to Rome, dontcha' know? And he hates Rome! Ken, please. You are talking to me, Guy Fawkes now. Don't tell me you believe this nonsense. Here is what Jerome had to say on Mary. I think he is more biblical than the other guy. However, as a Catholic, no matter how convincing Jerome's arguments are, I don't believe Mary remained a Virgin because he proves it. I believe it because Christ revealed it through His Church. Jerome just gives me powerful ammo against scoffers. It's kind of like his friend Augustine's statement about how he would not believe the Bible if not for the testimony of the Church. Christ established the Church. As Joan of Arc said at her trial, "Christ and the Church are One". Run, don't walk, to your nearest Catholic Church and enroll in RCIA classes. "As I said a little ago, when these men are beset by clear testimonies of Scripture, and cannot escape from their grasp, they declare that the passage is spurious. The declaration only shows their aversion to the truth, and their obstinacy in error." NPNF1: Vol. IV, Reply to Faustus the Manichaean, Book XI, §2. Reminds me of many Roman Catholic apologists. "has got you guys disagreeing on whether Baptism is important or not"
Everyone orthodox agrees that Baptism is important; I think only the Quakers and the Salvation Army got rid of water baptism. They are weird. 1. over infant baptism of children of adult believers or whether it is only for a person who is old enough to understand that they are sinner and who first repents and trusts Christ. Even Justin seems to agree with that. (granted, most also think he teaches baptismal regeneration, but I honesty think Tim Kauffman poked enough holes in that to question that) But it is clear that a person must first be persuaded and understand and think and repent and trust Christ, Justin says, "pray and fast", and THEN they are brought to the water. "As many as are persuaded and believe that what we teach and say is true, and undertake to be able to live accordingly, are instructed to pray and to entreat God with fasting, for the remission of their sins that are past, we praying and fasting with them. Then they are brought by us where there is water,and are regenerated in the same manner in which we were ourselves regenerated. For, in the name of God, the Father and Lord of the universe, and of our Saviour Jesus Christ, and of the Holy Spirit, they then receive the washing with water. 2. The other main difference is about sprinkling, pouring or immersion/dunking/dipping. 3. Lutherans have a form of baptismal regeneration, but it is different than the RC view. the way Jerome deals with those passages is just plain sophistry and illogic to the plain texts. Yes, I have a brain and the Holy Spirit, and I can see that Jerome is wrong on that issue. But he was right on the Apocrypha and that elders and bishops are the same office. Guy - do you agree that no one goes to hell unjustly? God's justice sends people who don't trust in Christ to hell. He explains His justice in leaving some in their sin and having mercy on others beforehand. Notice the word "beforehand" is for the vessels of mercy, not for the vessels of wrath. The vessels of wrath are justly left in their sin; as the wrath of God is His justice against sin. Fly, run to Christ alone and His pure gospel. Forsake the man-made traditions that the RCC has added onto the gospel, thus corrupting the gospel. who converted to Rome, years ago (1996), in October of 2000, wrote an article at the Catholic Exchange web-site entitled "Lead, Follow, or Get Out of the Way" (no longer on line; I wonder why?- It seems obvious why they took the article down, as you can see later. Fortunately I printed it out and still have it.) Some of Rod's articles are still at the Catholic Exchange web-site, but this one is not. Rod wrote of his experience in the RCIA class. Below is some of his article. "The first session began . . . It was mainly about birth-control. You needn't worry about it, we were told. The decision had been make by celibate old men, based on faulty medieval philosophy, and would be reversed as soon as a more enlightened generation of churchmen rose to power. No kidding, that was the first session. Not the existence of God, or the nature of man, or original sin, or even a Baby wrapped in swaddling clothes, lying in a manger. No, the single most important thing to get out of the way at the start was to reasurre the engaged couples that we weren't going to do or say anything here to upset their wedding plans." "The second session was the same only worse. A priest got up and told us that just because of some us might disagree with Catholic teaching, well, we shouldn't let that slow us down a bit. The only two things you really have to believe, he solemnly assured us, were the Immaculate Conception and the Assumption of Mary. Everything else is up for grabs." "As a matter of fact, I've got a lot of problems with the Nicene Creed myself." "What could I say to that? It had been my understanding, up to this point, that a priest who stands up and publicly denies the Nicene Creed has just excommunicated himself." so much for the infallible church! Rod was rightly upset and was greatly disturbed by this; and was especially saddened by the fact that a couple who admitted they were atheists came to the first two sessions to "see and understand what the Catholics believe". They never came to the third or any more sessions. I wonder how many other RCIA classes all over the RCC world who are taught by heretical and liberal priests? An claim to be an infallible church in doctrine should be able to get rid of priests who are heretics and teach false doctrine. I see the discussion is no longer on matthew 16. I guess we are now on the Mary topic.